Rough Drafts supports the development of new Australian works by providing artists with an opportunity to experiment and grow their ideas. Writers, directors and theatre makers are given access to a rehearsal space, a paid team of actors or creatives and dramaturgical support. They may use the week and resources to embark on something currently unscripted or they might choose to develop a script that is already complete in draft form. The outcomes vary greatly according to the project. At the end of the workshop week, we invite you into the development process to have a sneak peak of a work in progress at the free public showing. These showings are an opportunity for the artists to test their ideas in front of an audience... and it’s a chance for you to learn about how new plays are made. Former Resident Director, Imara Savage, and current member of STC’s Emerging Writers Group, Emme Hoy, resume a collaborative relationship that began on STC’s production of Saint Joan to create a new work inspired by Mary Shelley’s iconic novel Frankenstein. The play is in the earliest stages of development and the team are using the week to develop a concept and begin drafting scenes, a selection of which they will present at the showing. 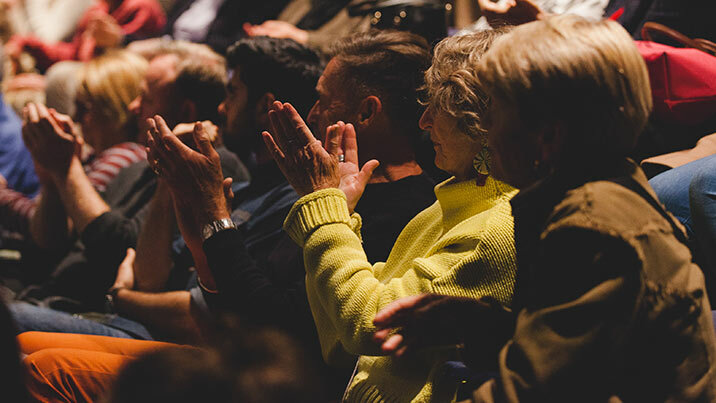 Giving an audience to their initial thoughts and ideas gives the Artists an invaluable opportunity to grow and shape the work so we hope you can join us. Disaster has struck. The artists are all gone; parts of Europe have succumbed to swarms of genetically modified wasps; artificial seaweed has choked the oceans; and despite the efforts of lab-grown algae, the oceans are freezing over. And of course, it’s all a woman’s fault. By debuting her gene-editing technology on an unborn fetus – who just happens to be her own daughter – a woman has unleashed humanity’s Edenic fall from grace. Now that the human genome can be edited to a state of perfection (for the right price); social inequality is growing; the genetic variations that support creativity are dying out – plants are trying to kill us, and eugenics are part of the day-to-day. Three nightmarish acts – spaced decades apart – reveal the destruction of a world in the face of uninhibited progress, capitalism and greed. Mixing black comedy, intimate domestic scenes and global destruction - the play will ask: where do we end? Emme is a member of Sydney Theatre Company’s Emerging Writer’s Group. She provided additional text for STC’S production of 2018 production Saint Joan. In 2017 she was recipient of Belvoir Philip Parson’s Fellowship and was shortlisted for the Patrick White Playwright’s Award and the Griffin Award for her play Extinction of the Learned Response. 2019 productions of Emme’s work include a libretto adaptation of La Finta Giardiniera for the Queensland Conservatorium, Extinction of the Learned Response at Belvoir’s 25a, Chorus at Red Line Production’s season at the Old Fitz and ATYP’s premiere of Bathory Begins. Emme completed her Master of Fine Arts in Writing for Performance at NIDA. Imara Savage is a theatre and opera director who has directed award winning productions for Sydney Theatre Company, Belvoir Theatre, State Theatre Company of South Australia, Sydney Chamber Opera and Griffin Theatre. For STC she directed Saint Joan, Top Girls, After Dinner, Dinner, The Testament of Mary, Hayfever and Machinal.